A group of students alongside their teacher decided that they wanted to go out and help on a care & community project in Ghana. The group worked together to fundraise to pay for their trip organising events ranging from cake sales and fashion shows to curry nights. A group of nine students set off for Ghana at the end of the summer term for a couple of weeks working in Kumasi. The group all stayed together with a local family giving them a chance not just to explore the local cuisine but also to chat with and find out about life in a Ghanaian family. The group did a combination of painting and decorating work at the local school alongside tree planting and some teaching in the local kindergarten. The group worked at the Kumasi orphanage helping to both entertain and educate the children. This ranged from teaching them maths and english to organising a sports day for the students. The opportunity for the young children to play educational games was received enthusiastically. A particular favourite was "duck duck goose"! 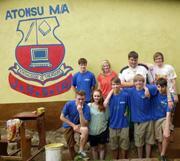 The hard work was done painting three classrooms over the two weeks at the Atonsu MA school. The group proudly painted the Ackworth school logo on the wall of the school to show the work they had done. The group helped to promote environmental awareness by going into the local junior high school and planting trees with local students. One of the highlights of the trip was the match between the volunteers against the Atonsu MA school. The group donated football shirts and equipment they had brought from the UK. They even played a game against the school for the "Ackworth Cup". The exciting game ended in a 3-3 draw with the school winning the cup on penalties. The group travelled from inland Kumasi down to the coastal town of Cape Coast where they visited the slave fort on the beach and discovered lots about the history of Ghana and slavery. They then explored the top of the rainforest from the top of the canopy walkway before breakfasting next to crocodiles at Hans cottage. “The experience is one which will stay with me through my life…..I took from my time in Ghana; a respect for the opportunities I've been given, an appreciation of family, a thirst for returning and building my relationship with the children I worked with and an admiration for the Ghanaian culture"
Read more about Care & Community in Ghana.